Attorney General Jeff Sessions announced the creation of a “Religious Liberty Task Force” at the Justice Department. 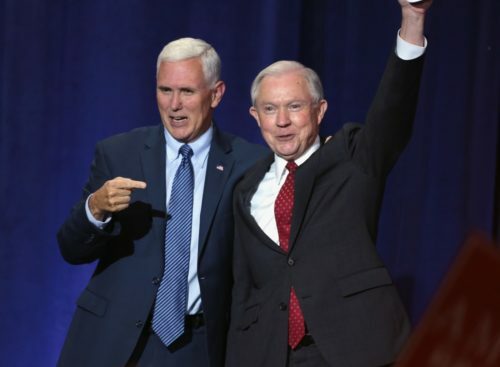 Sessions announced the task force in a speech this morning, where he said that Donald Trump’s election has given the right a “rare opportunity” to stop a “dangerous movement, undetected by many” that is eroding religious freedom. “We have gotten to the point where courts have held that morality cannot be a basis for law; where ministers are fearful to affirm, as they understand it, holy writ from the pulpit; and where one group can actively target religious groups by labeling them a ‘hate group’ on the basis of their sincerely held religious beliefs,” Sessions said. Sessions mentioned Jack Phillips three times. Phillips is the owner of Masterpiece Cakeshop, which took a case to the Supreme Court recently to ask for a religious exemption to Colorado’s antidiscrimination law so that it could refuse to serve a gay couple. But while conservatives prefer to talk about cases involving cake, the Trump Administration this past January announced a new Department of Health and Human Services initiative to advance doctors’, nurses’, and other medical workers’ “religious freedom” to refuse to help LGBTQ people. The task force will be co-chaired by Associate Attorney General Beth Williams and Jesse Panuccio, a lawyer who fought for the supporters of Proposition 8 in California, a 2008 ballot initiative to ban marriage equality. Kurtz argued that anti-discrimination policies were hurting children because many states refuse to work with adoption and fostering agencies that want to ban LGBTQ parents. “Faith-based child welfare providers are being targeted for closure because of their religious convictions about the family. The number of children in need is going up, yet in places like Illinois, Massachusetts, San Francisco, here in D.C., service providers who have a track record of excellence in recruiting and assisting foster families have been shut down,” Kurtz said. LGBTQ advocates are worried that the task force would be used to roll back equality. “This taxpayer funded task force is yet another example of the Trump-Pence White House and Jeff Sessions sanctioning discrimination against LGBTQ people,” said HRC Legal Director Sarah Warbelow. But Liberty Counsel, a Southern Poverty Law Center-designated hate group, was pleased with the announcement. “The establishment of a Religious Liberty Task Force is an historic and positive step by the Trump administration to protect religious freedom and the rights of conscience,” said Liberty Counsel’s Mat Staver in a statement.